In 1983 my husband was found to have terminal, medically incurable metastatic colon cancer, and was given only four to six months to live. As a physician I knew modem medicine could do nothing to save him. At best, it might slightly prolong his life at the cost of all the side effects of chemotherapy. Having grown up in the Orient, I had seen people who had used various Chinese ap proaches recover from illnesses that modem medicine has no idea how to cure. Thus we knew that if one form of healing didn't work, we could try anothen We named to macrobiotics. Many of my colleagues thought I was crazy. "How can you feed him that stuff in his dying days?" 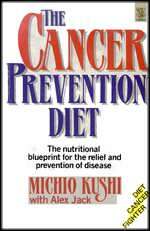 they would ask, as they showed me article after article stating emphatically, " after a carebil search of the literature, there are no documented cases of recovery from cancer using the macrobiotic diet." Furthermore, many learned writers cited the extreme danger of malnutrition on the macrobiotic diet But every day, instead of dying my husband was looking stronger and healthier. Macrobiotics seemed to be working. I vowed that if he recovered I would document his case and submit it to a medical joumal for publication. I was sure they would want to know of his recovery. In July 1984, eight months after his case was described as hopeless, not only was my husband feeling healthier than he had ever felt in his life, but a follow-up CT scan revealed that about 70 percent of the cancer was gone! I was beside myself with excitement Some 60,000 people a year in the United States alone die from metastatic colon cancer, and the medical profession has openly stated it has made no significant progress in the treatment of colon cancer in more than fifty years. With this in mind, I called the American Cancer Society to let them know the wonderiul news. I asked to speak to the director. I was shocked when I heard him say "It is of no interest to us." Well, I thought, maybe it was of no interest to him, but perhaps the NIH, and the National Cancer Institute would like to know. They too responded, "It is of no interest to us." I could not believe that the medical institutions of our country really weren't interested; perhaps they just needed to hear of more than one case, and in writing. So, at great personal expense, I set about finding medically incurable cases that had recovered using macrobiotics. With the help of one of my colleagues, we carefufly documented six such cases, and submitted them in an article to the New England Journal ofMedicine for publication. We were sure the editors of this well known medical joumal would want the rest of the world to know, however strange it was, a small group of people had experienced total regression of medically incurable cancer while using a dietary approach to creating good health. I was deeply shocked when I received their response, "It's of insufficient interest to our readership." I refused to believe our medical institutions, filled with dedicated scientists, did not want to know there might be an inexpensive way to heal a disease that is killing one in five Americans every year. I decided perhaps my article documenting these cases might rot have been written well enough. After all, I am an emergency room physician and not a professional scientist. Once again, this time with the assistance of a professional medical research writer, I rewrote the paper and submitted it to the Lancer and later to the Journal of the American Medical Association. Both, to my astonishment and dismay, replied it was of insufficient interest to their readership. What does all this mean? Does the medical profession really want to know if there is a possible way to cure cancer, or do they just want to keep funding a system that clearly has made next to no progress in the treatment of most cancers in the last fifty years? They state repeatedly in their articles that a careful review of their literature reveals there are no documented cases of recovery using macrobiotics, and further, macrobiotics is nutritionally unsound and potentially dangerous. Of what use is a careful review of their literature if medical joumals refuse to publish any cases indicating macinbiotics, or any other unconventional approach to healing for that mafler, may have played an important role? Are our major scientific institutions made up of scientists who truly want to heal cancer? Isn't it strange these great institutions had no interst in reviewing the cases, going over the pathology slides, the x-rays and so on? Isn't it strange they had no interest in examining these patients care-hilly to look for the development of special antibodies that could help better understand regression of cancer? What kind of scientists do we have working in these major institutions? 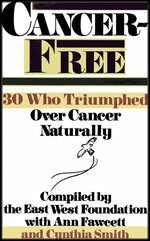 In the book Cancer Free she presents six case histories of patients with advanced, medically incurable cancer who experienced a complete regression through macrobiotics.